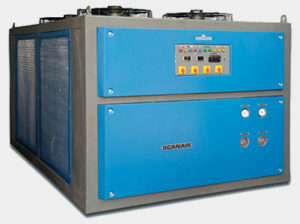 Scanair manufacture chilling plants, both Air Cooled and Water Cooled type used in various industrial processes and production machinery applications can be used to cool any machine or process that operates from 10oC To 30oC or over. A cooling tower will be used to cool any machine or process that operates at 40oC or higher. Chilling plants range starts range from 1 Tr to 50 Tr, 450 Kcal/Hr to 150000 Kcal/ Hr, 3 LPM to 650 LPM with different flow capacity, self contained portable units through to completely installed turnkey based systems for many more application like injection molding, Blow molding, Rotational molding and other forms of processing plastics. Standard systems are available in stock with Shell and Tube Heat Exchanger, Brazed Plate Heat Exchangers with and without pump and storage stainless steel tank and higher efficiency than ever before scanair chilling plant can be portable of standalone type. chilling plants can be used for multiple applications and be wheeled to each station with convenience. units are light-weight and have small foot prints which makes it easier to move over around other equipment. Standard and Custom Built Chilling Plants are available with Cupro Nickel, Brazed Plate, or Titanium Evaporators and Condenser Heat Exchangers can be utilized for corrosive material applications. Speed and accuracy of production will increase as you maintain a constant and proper cooling temperature in your equipment the chilling plant will reduce the number of rejected parts while increasing the number of parts produced per hour. A cooling tower may provide adequate cooling during winter months but it will fail during the hot summer period of the year a water chilling plant will immediately eliminate this problem. Lamination machine will produce an incredible amount of heat to seal the plastic material around printed documents and other production. In an industrial laminating environment this heat needs to be dissipated through chilling plant. 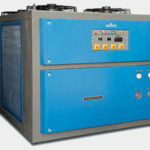 If it doesn’t the laminating machine will not function properly, with chilled water circulating through it to keep it as desired temperature. Chilling plants are commonly used, when a plastic sheet is heated in thermoforming process to a pliable forming temperature formed to a specific shape in a mold and trimmed to create a usable product the sheet when referring to thinner gauges and certain material types is heated in an oven to a high enough temperature that it will be stretched into a mold and cooled to a finished shape. Thin gauge thermoforming is ideal for the manufacture of disposable Cups, Containers, Lids, Trays, Blisters and other products for the food medical and general retail industries thicker gauge thermoforming includes parts manufacture of vehicle door and dash panels, Refrigerator Liners, Utility vehicle beds and plastic pallets etc,.